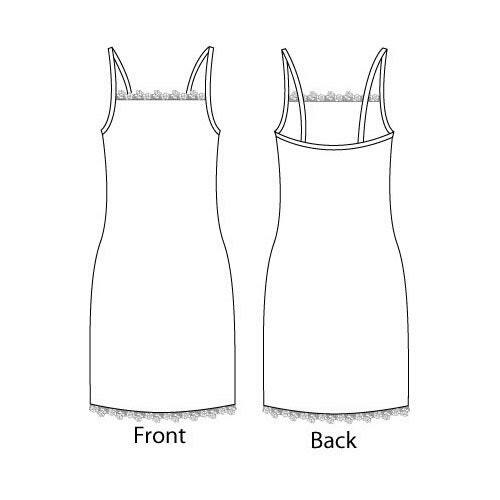 This is a very simple slip dress dress sewing pattern. The dress should be made from a stretch jersey, which means there is no need for a fastener, as the fabric will stretch for the night dress to be pulled on over the head. The straps and edge binding are in one piece and the front edge and hem are to be trimmed with lace. This would also make an ideal beach or summer dress, just omit the lace, bind the top front edge and hem them bottom. This is a good beginners project, but you will need to have a basic understanding of sewing patterns and pattern markings. If in any doubt please refer to a good sewing book. Full graphic sewing instructions are included.